Melasma is a common skin condition that causes the appearance of brown to gray-brown patches of skin. Most people get it on their cheeks, bridge of their nose, forehead, chin, and above their upper lip. It can also appear on parts of the body that get a high level of sun exposure such as the forearms and neck. Melasma can affect anyone and it happens when the body produces too much melanin, a natural substance that gives colour to our skin, hair and eyes. 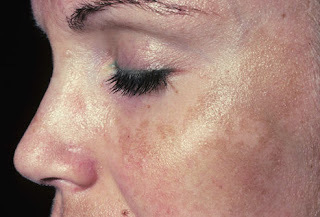 More than 6 million women are estimated to have melasma. Melasma will affect 10% of males. People with a family history of melasma are more prone to melasma as well as individuals with darker skin tones since they have more active melanocytes than individuals with light skin. Sun exposure is a major melasma trigger because ultraviolet (UV) light from the sun stimulates the melanocytes, which can increase melanin production. Melasma is sometimes referred to as “the pregnancy mask” or chloasma since it’s so common during pregnancy. Avoidance of sun exposure, constant use of broad-spectrum sunscreens .Skinceuticals Ultra 50 or Physical Fusion UV Defence SPF 50. What are some melasma treatment options? Procedures for melasma include chemical peels, microdermabrasion, and laser treatments. Treatment of melasma should involve the following: topical application of a cream containing 0.05% to 0.1% retinoic acid (tretinoin).